Also Called: Woollypod vetch, winter vetch. Stems: 20-80 inches long, sprawling or climbing nearby plants, conspicuously hairy. Leaves: Alternate, even-pinnately compound, 2.5 to 6 inches long, ending in branched tendrils; leaflets 10-24, narrowly oblong to linear-lanceolate, .5 to 1 inch long; margins entire; tips often abruptly pointed; stipules lanceolate. Inflorescences: Racemes, on elongate, hairy stalks, 8-60-flowered, flowers all on same side of rachis. Flowers: Calyces conspicuously swollen at bases, lower teeth often long hairy; corollas papilionaceous, 3/4 to 1 inch long, violet, violet and white, or purplish red; stamens 10, 9 united, 1 free. Fruits: Pods, glabrous or pubescent, about 1 inch long; seeds several, spherical, dark. Habitat: Cultivated fields, waste places, and roadsides, most abundant in sandy soils. Toxicity: The seeds are said to be poisonous to cattle, causing bellowing and seizures, symptoms that resemble rabies. This is observed more often in black cattle. Consumption of the foliage also causes dermatological problems in cattle. 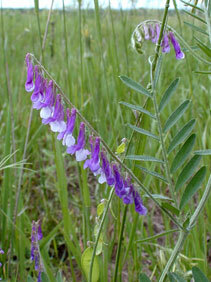 Comments: Hairy vetch was introduced from Europe, escaped from cultivation, and now is naturalized. It does well in drought conditions.